There is a higher rate of evictions for Aboriginal people than there are for non-Aboriginal people. some of the cultural issues that may lead to problems in tenancy. There are many different types of living arrangements that indicate a person is experiencing homelessness. According to the Australian Bureau of Statistics’ definition, homeless people are those who have no shelter, those who live in a dwelling that is inadequate, or has short or no tenure, and those whose dwelling does not allow them to have space for social relations. This includes people living in ‘severely crowded’ dwellings—that is, in dwellings requiring 4 or more additional bedrooms to accommodate the people who usually live there. Homelessness among Indigenous Australians Publication presents information on the prevalence of homelessness among Indigenous Australians, the characteristics of Indigenous people who are homeless, and the use of specialist homelessness services by Indigenous people who are homeless or at risk of homelessness. On Census night in 2011, there were an estimated 26,743 Indigenous people experiencing homelessness, comprising 28% of the total homeless population. 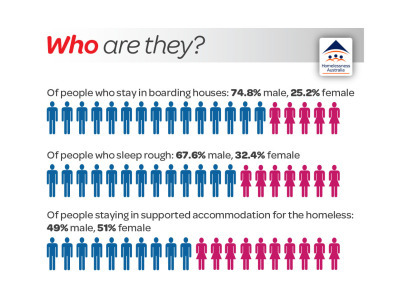 Three-quarters of homeless Indigenous people were living in severely crowded dwellings. In 2012–13, about 1 in 5 clients of specialist homelessness services were Indigenous—an estimated 54,885 clients.